So I got a little curious where terms like “bro science” come from and decided to do a little research over the interwebz. Turns out some of these terms have very recent origins, while other terms didn’t come from the sources that I thought they came from. If interested in the history of such terminology as “bro” and “swole”, then you are very welcome to join me on a journey down memory lane. On the way, you will get your mind blown (literaly) and your life will be enriched by deep thoughts from modern culture’s greatest thinkers. Let’s start with “bro science”. There are actually two most frequent spellings of bro science, one where the two words are separate, and another one where the two words are spelled as one word: “broscience”. Mind blowing, isn’t it? No matter how it is spelled, bro science is composed of two basic words: bro and science. The word “science” is pretty obvious, however what is a “bro”? Bro is a shortened version of the word “brother” and the first instances of the use of the shortened version come from hundreds of years ago. However the real popular use of the word started only in the 1970s among black communities in the US. Somehow in the 1990s this term jumped over to the white populations and began to be used more extensively, probably first among the whiggas (wanna-be you know who) and then among fraternity douchebags. Now, the most common image of “bros” are the frat type, baseball hat wearing or scruffy haired white boys who like to jug down beer from funnels. Sometimes these are referred to as “brahs”, which comes from a Hawaiian English pidgin word and began to be used among surfer dudes in the 1960s. As the word bro became more and more popular, it was added to all kinds of words and phrases, resulting in a wide variety of brocabulary. Another compound word that was formed through the addition of the word “bro” is “bromance”. For example, Brody Jenner, the most relevant person of the past decade used this as the title of his reality TV elimination series, where he searched for a new BFF. The term is most often used to designate the friendship of two “bros”. Through the expansion of the word bro, our culture has also been enriched by another concept, that of the “guido”. This concept has gone mainstream through an MTV show that will remain a timeless classic for generations to come, “Jersey Shore”. Jersey Shore brought us such intellectuals as Mike the Situation and Snooki. The word “guido” comes from a common Italian first name and came to signify a sub-population of fake tan, slicked-back gel hair type Italian-Americans from the East Coast. We will forever be thankful for this cultural enrichment. Now that we know where the word “bro” comes from, we will investigate further where the particular combination of “bro science” came from. The first usage of this term comes apparently from 2008 and in 2010 the term took off, enjoying a wild climb in popularity. Bro science has heavily impacted the way we view getting bigger and stronger, but it is not the only phrase that made it big. 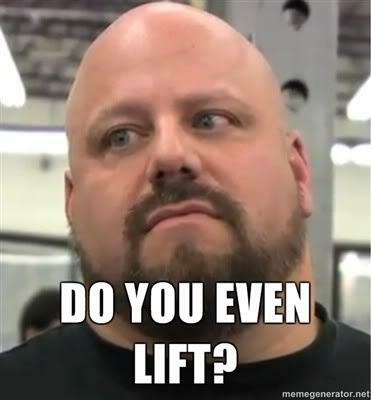 There are also other popular phrases that come into play in the world of weightlifting. Our exploration will continue by examining a few of the most trendy ones. So keep tight and get ready for some clean and jerk. 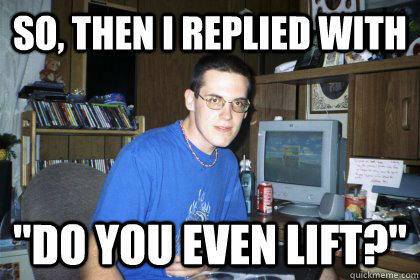 One of my favorite phrases is of course “Do you even lift?” 🙂 Apparently this one originated on the bodybuilding.com message boards all the way back in 2002. We all know Ah-nold. I used to love his action movies back when I was a kid. His movies were full of intellectual dialogue and hit one liners such as “I will be back!” and “Hasta la vista, baby!” So I thought “I want to pump you up!” came from one of these movies. Apparently this one didn’t even come from Ah-nold (although he did adopt it later), but from some of his impersonators, a comedic duo called Hans and Franz (played by Dana Carvey and Kevin Nealon), who used to do a recurring sketch “Pumping Up with Hans & Franz” on Saturday Night Live back in the late 1980s. This classic saying comes from Ronnie, one of the resident philosophers at Jersey Shore. He said it in 2010. So we have now come to an end of our current brosearch. Don’t despair though; more is coming! Tune back next time when we explore curlbros, swag, celltech, swole, as well as such internet shirtless icons as Zyzz and Lazar Angelov. What are your favorite expressions? I encourage everyone to come at me in the comments below.